Clot retraction is the shrinking of a blood clot facilitated by thrombolytic agents. Clot retraction is dependent on the release of multiple coagulation factors, specifically Factor XIIIa at the end of the coagulation cascade. The formation of blood clots can cause a number of serious diseases. By breaking down the clot, the disease process can be arrested or the complications reduced. Clot retraction is the “shrinking” of a blood clot over a number of days. The edges of the blood vessel wall at the point of injury are slowly brought together to repair the damage. Clot retraction occurs due to the contraction, knotting, and twisting of the fibrin mesh. The steps of wound healing that follow clot retraction include inflammation, tissue proliferation, collagen and granulation tissue deposition, angiogenesis, wound contraction, and epithelialization. Clot retraction: The shrinking of a blood clot over the day following initial clot formation. angiogenesis: Growth of new blood vessels during wound healing. The blood clots produced in hemostasis are merely the first step in repair and healing that occur after injury. Following a clot, inflammation draws leukocytes to the injury site to eliminate any pathogens that may have entered the body during the initial injury. Then, over the course of the next 24 hours, the clot retracts as tissue healing begins. 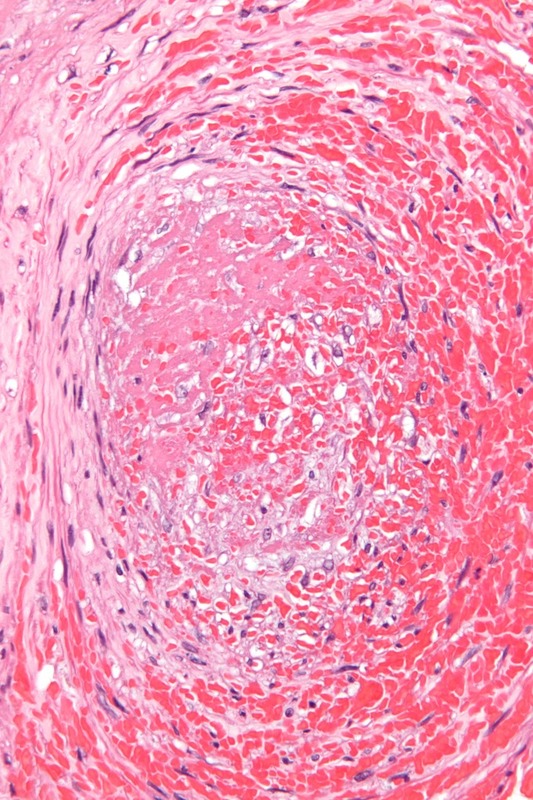 Thrombus or Blood Clot: Micrograph showing a thrombus (center of image) within a blood vessel of the placenta. As the healing process occurs following blood clot formation, the clot must be destroyed in order to prevent thromboembolic events, in which clots break off from the endothelium and cause ischemic damage elsewhere in the body. By reducing the size of and breaking down the clot, the disease process can be arrested or the complications reduced. Clot retraction refers to a regression in size of the blood clot over a number of days. During this process, the edges of the endothelium at the point of injury are slowly brought together again to repair the damage. Clot retraction is dependent on the release of multiple coagulation factors released at the end of the coagulation cascade, most notably factor XIIIa crosslinks. These factors cause the fibrin mesh to contract by forming twists and knots that condense the size of the clot. Clot retraction generally occurs within 24 hours of initial clot formation and decreases the size of the clot by 90%. Following clot retraction, a separate process called fibrinolysis occurs which degrades the fibrin of the clot while macrophages consume the expended platelets, thus preventing possible thromboembolism. While the clot retracts, the wound begins to heal. The first step of wound healing is epithelial cell migration, which forms a scab before the clot retracts. This occurs due to the stimulus of platelet-derived growth factor (PDGF). After clot retraction, true repair begins as tissue proliferation starts and collagen from the extracellular matrix is deposited in the wound while granulation tissue forms. Then new blood vessels grow into the healing tissue in a process called angiogenesis, which is stimulated by vascular endothelial growth factor (VEGF). The wound itself contracts, reducing in size. After these steps occur, new epithelial cells grow to cover the wound. If the wound was severe or unevenly shaped, or if healing takes too long, scarring may occur from collagen deposition. Most scarring on the skin is benign, but scarring inside the tissues of organs such as the heart or the lungs can cause health problems.